Mike Bryant is a hypnotherapist, counsellor, and an expert in mental health. 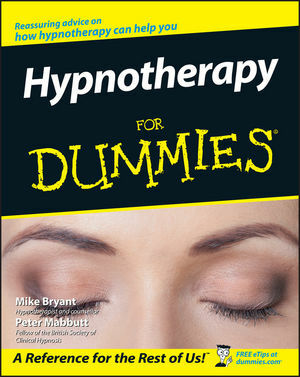 Chapter 1: Examining Hypnotherapy . Chapter 2: Techniques: The Tools of a Hypnotherapist . Chapter 3: Preparing for Hypnotherapy . Part II: Considering How Hypnotherapy Can Help. Chapter 4: Making the Mind-Body Connection . Chapter 5: Breaking Away from Old Habits . Chapter 6: Touching on Body Matters . Chapter 8: Considering the Limits of Hypnotherapy . Part III: Expanding the Reach of Hypnotherapy. Chapter 9: Your Kids and Hypnotherapy . Chapter 10: Visiting Your Former Selves . Chapter 11: Removing Your Phobias . Part IV: The Practical Stuff. Chapter 12: Finding a Hypnotherapist . Chapter 13: Your First Hypnotherapy Session Step by Step . Chapter 14: Practising Self-Hypnosis . Chapter 15: Meeting the Family: Some Cousins of Hypnotherapy . Chapter 16: Ten Common Misconceptions about Hypnotherapy. Chapter 17: Ten Pioneers of Hypnosis . Chapter 18: Ten Qualities to Look For in a Hypnotherapist . Chapter 19: Ten Tips for Choosing a Hypnotherapy Training Programme.